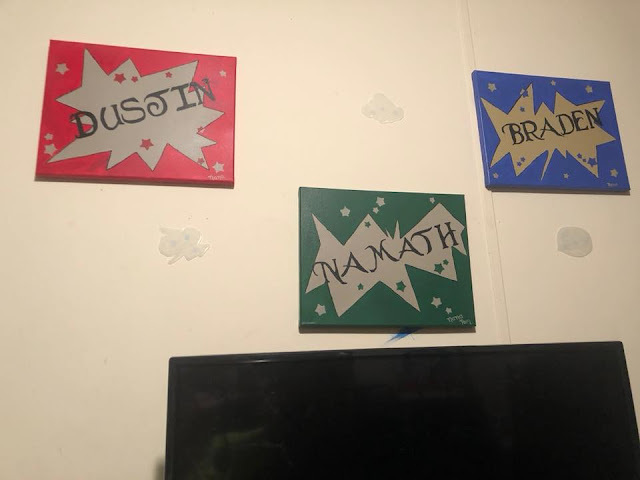 My daughter finally got the boys name paintings hung. I plan on doing the older boys theirs too. Getting a lot of painting done while away from home... I not only cook a home coming meal for my brother and sis in law when I stay there, I usually leave gifts. This was painted on 5x7 for the house. But this however was painted for me. I painted one like this last yr for my home so this yr I did this one for my sis in law. One that names all the folks in the family... Her own little (BIG) Brady Bunch Family. Then I painted one for my other sis in law. 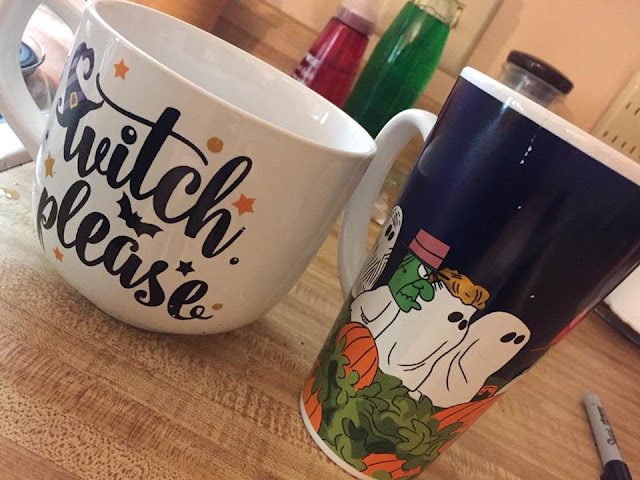 Pulled out my Halloween coffee cups out the other day. Then I was at the Dollar store the other day and I picked up one with autumn leafs on it. Here I am drinking coffee in bed yesterday. The weather turned cooler and I was COLD. That I painted for my nieces baby's room?? Here are the last two. Goat. Happy Bday Braden. Nana loves you. When I travel I try to bring back rocks that I can decorate to place in my garden. This is the one I picked up in La Jolla Ca. on the ocean. 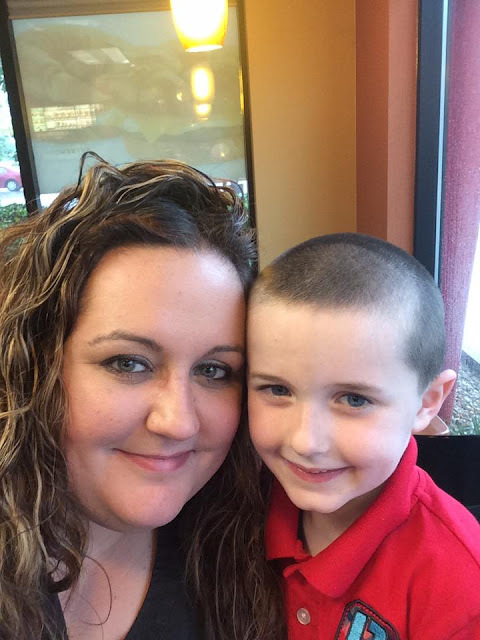 I did not get one for La Mesa where my son lives cause I have one from before but I did get one for Mt. Palomar, just not painted it yet. I place these in my garden so when I do the walkabout in the yard or water I look down and see these painted jewels. Headed to my older brothers later today after I feed the horses. Dakota will be staying at mom's till Sat. afternoon and Lily is going with me. 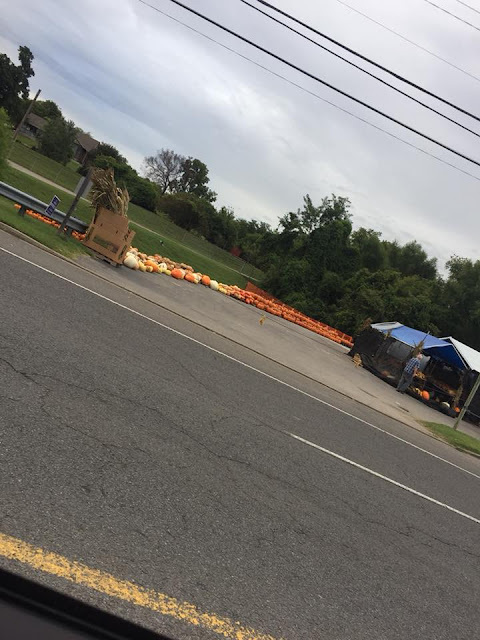 Pumpkins out at the market right down the street... It's beginning to look a lot like fall! I have been painting. My niece is due anytime in the next couple of weeks. She is doing the babies room in farm animals. She owns a farm and the animals I have painted are what she has on the farm. I have a horse head and the head of a goat to paint, apply hangers to the backs and get them to her. I have also been working on rocks to drop in our area. You can see what this area turns out on facebook at 615 Rocks. But in my defense, this girl is always there. She never ventures far from the barn and I called and called... I walked the pasture and there was not sign of her. 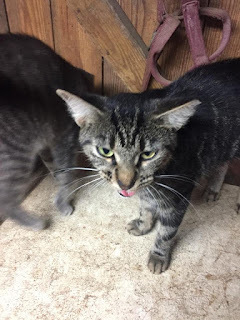 I went to the barn early yesterday morning to clean and after being there an hour I heard the fimilar sound of Tigress' meow. Here she comes walking across the beams in the barn. BRAT. I wanted to wring her neck but instead I loved on her. I had stopped watering outside due to my health issues and not having the get up and go to go. My Egyptain Bean plant had not been producing blooms and seeds but after rain yesterday.....it decided to give it the ole plant try again! If you look you can see a black seed nestled between the two pink blooms. Yay...I actually found two! Once the blooms die back there will be more seeds. Yep, picked that babe and took it in to plant next yr.